I am not perfect. This post is proof of that. One of the books I read on the beach in August was The Perfect You by Dr. Caroline Leaf. I wrote a post about it, how reading it was challenging but I thought worthwhile. Somehow that post vanished into cyberspace on my phone. I’d blame the instrument, but being less than perfect it was probably operator error, something as simple as forgetting to save or pressing delete at the wrong moment. However, I did want to give my impressions of the book, though now I am going from memory. And I must admit, with more time to reflect, I am less sure about how worthwhile the book is. On the plus side, The Perfect You is a refutation of those who think Christians don’t take a scientific approach to things. This is a self-help book firmly rooted in neuroscience. However it is at times so complex I don’t know if it is science or psychobabble I am being asked to accept. If I had spent a couple of weeks studying the subject I probably would be able to evaluate all the science. I’m assuming the publisher did that for me and the concepts are somewhat solid and scientifically verifiable. It seemed to make sense to me and I did definitely appreciate how Leaf integrated scripture with her concepts. Self-help books aren’t my normal reading material, so perhaps I have some unconscious biases coming into play. Science aside, I’m not sure about how effective this book is as a tool. It is supposed to help you discover your true identity, but can a book do that? About a quarter of the volume is given over to a rather detailed personal evaluation, with lots of blanks to fill in. Great idea, but I’m not sure that most people are all that good at self-evaluation. I think the questions would be better handled in a more formal counseling situation as opposed to just reading a book. Then again, some people, for various reasons, don’t have access to counselors so maybe this is a brilliant idea, just not something I would do. 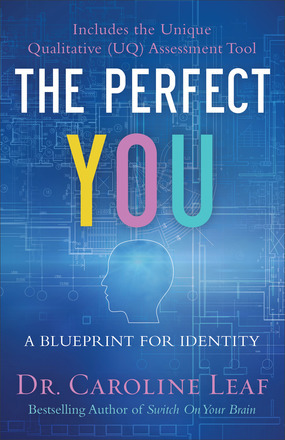 What bothered me most about The Perfect You was a feeling throughout that someone is trying to sell me something, so I had better firmly hang on to my wallet. I think it was the capitalization that turned me off. In Scripture we are indeed exhorted to be perfect as our heavenly Father is perfect. I won’t get into what could be a long theological debate about whether such perfection is attainable for humans. It seems unlikely for me anyway, but maybe I’m not spiritual enough. Much as I appreciate science, this book would have been stronger if the language was a little less scientific. It is almost as if Leaf was unsure of her audience. Someone wanting to use it as a self-help tool probably doesn’t need the scientific details, just the knowledge that it is a valid approach. Scientists wouldn’t need the questionnaire. I guess that leaves me feeling somewhat unsatisfied about the book. I guess that is another sign I’m not perfect.